Archaeological and discovery trails, a sheep centre, a gigantic adventure play area, an indoor animal barn with lambs, calves, piglets, chickens and a pets area and an information room. Three hundred and twenty nine acres of farming fun, a wildlife and riding centre and a crafts centre in a beautifully restored farm building with workshops, orchard tearoom and gift shop. Open all year. Last admission 1 hour before closing. Park admission: Adult £5.50, senior £4.50, child £4.50,under 3 free. 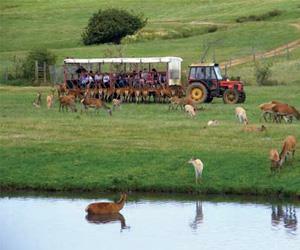 Farm admission: Adult £8.95, senior £7.95, child £6.50 under 3 free.